Published in RAVEN Contemporary, July 2015. 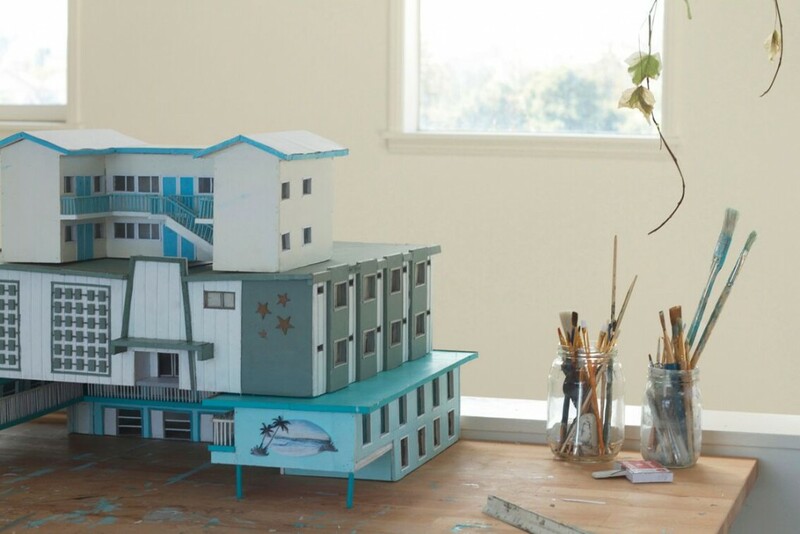 Photographer and model-maker Anna Carey creates tabletop architectural structures that evoke sceneries of nostalgia, transitoriness and urban iconicism. Mariam Arcilla spends an afternoon with the artist at her home studio in Los Angeles. Blue is the most abundant colour in Anna Carey’s works, she tells me. Fittingly, I arrive at the artist’s North Venice apartment to discover its exterior coated in periwinkle blue, from the tiled walls to the balcony that overlooks the mountains. Anna works from here, on the top floor of her loft-style abode, with its daylight spillage serving as the ideal terrain for her miniature empires. 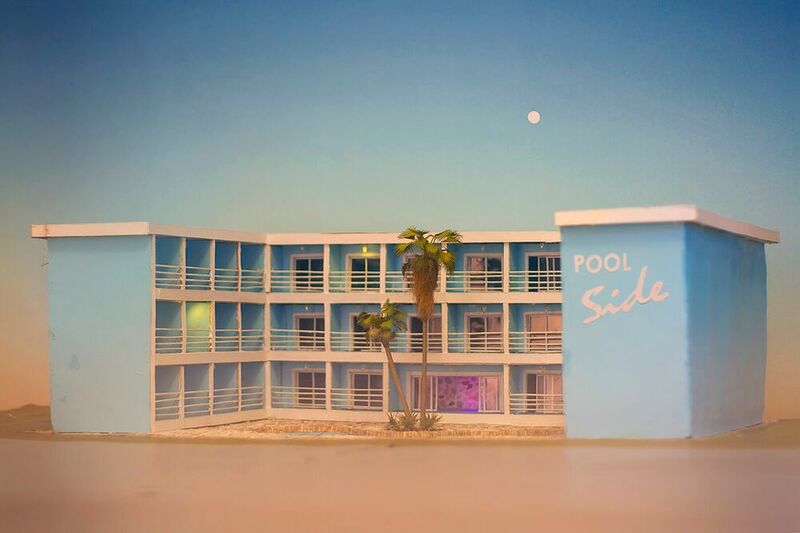 After making a couple of trips to exhibit at Photo LA, the Gold Coast artist, who briefly resided in Melbourne, made the big move here in February, where she plans to spend a year researching and visiting areas entrenched in America’s mass-produced motel culture. Her lounge and kitchen remain stark — “I don’t own a TV, and I’ve yet to get proper furniture and decorate,” she admits — but to countervail, upstairs is where the pandemonium begins. Like Godzilla, we hover over a tiny street laid out on the carpeted floor, where foamcore signs boasting Heated Pool, Cable TV and King Beds are strewn next to toothpick-hoisted lodges shielded by cardboard roofs, stone walls and stenciled besser-blocks. Fanned across the table are paintbrushes in pasta jars, as well as case-study images from the internet of various motels across the world that share the same shimmering name: Star Dust. The similarities end here, for each accommodation harbours its own legacy, with various designs and architecture that preserve, decay and evolve throughout the years. As you construct these fictive premises, do you like to envision what types of people inhabit these worlds? I aim to create a space that looks as if it has had a life. So I do think of the different people that would move through them, and the traces they’d leave on the architecture. They could have been optimistic hotel owners, or families and honeymooners that stayed there in the motel’s glory days. Today these places are renovated, neat and clean budget motels. Or they are neglected. Guests today could also be young people on a road trip, elderly couples on vacation, or people down and out engaging in illicit behaviour. What materials go into assembling your works? I use foamcore, cardboard, paper, paint, Perspex and wire, as well as toothpicks, skewers, matches and sewing pins. I also use things I find in nature, like sand from the beach or pebbles from gardens. It’s like a treasure hunt. What prompted you to decamp to the City of Angels? And why North Venice particularly? I felt like a change, and LA is of interest to me because of my research. Also LA has so many great galleries and restaurants. Plus, I thrive in warm weather, and LA is not cold like other [US] cities. There is an openness about North Venice, it is an eclectic place with many diverse people, whether that be artists, computer technicians, yogis or students. Each area in LA is so different, from the manicured Beverly Hills neighbourhood to the grungy streets of Venice Beach. I find the vast differences so interesting. How have Americans taken to your work? Similar to audiences in Australia: people respond to the work because the architecture is so familiar. At times, they even think that they ‘know the place’ the work is based on. However, my work is never based on a specific place – instead it is built from memory and imagination that conflate many aspects of place and architecture into one fictional example. You seem to be mesmerised with natural lighting. What is it about the quality of light in LA that has you curious? I love the light in LA – it is diffused and dreamy. Apparently the light is a reason why the film industry developed here – it works so well on camera. For my new Star Dust series, I am setting up my models with backdrops of the Californian sunshine, similar to a movie set. Speaking of, you’ve based your new re-photography project on a slew of real-life motels called Star Dust. What attracted you to this series? The idea emerged after I visited the Neon Bone Yard in Las Vegas and viewed the original Star Dust sign. I’ve since located 44 other Star Dust motels from Google Maps and occasionally hotel websites. Some are in American cities of leisure, including LA, Las Vegas, Palm Springs and Miami, and along the highways of Texas, Montana and New Jersey. There are also Star Dusts in Suriname, Canada and Sri Lanka, and my hometown the Gold Coast. This encounter reveals how much contemporary culture copies and clones existing architectural icons. I created my first Star Dust motel for a previous work based on Gold Coast architecture, and when I continued my research I found past and present photographs of the same motels that revealed changes occurring within the spaces [Anna points me to a before/after image of a Star Dust motel in Georgia, with its revamped signage, repainted walls, and pool phased out with soil]. For this new series I will recreate the motels and photograph them, then renovate them and rephotograph them. Between 10-12 works will be displayed as prints for my November solo show at Andrew Baker Art Dealer in Brisbane. Personal plans for this year? I want to explore more of America. I’m going to New York in June for a friend’s wedding and to check out the galleries, and also visit Miami for their art and architecture, and hopefully for Art Basel. I’m also getting married in October at the ACE Hotel in Palm Springs, so I’m looking forward to being out in the desert with my friends and family. and Andrew Baker Art Dealer, Brisbane. Image 1: Anna Carey, Pool Side , 2014. Exhibited at David Malouf and Friends, Museum of Brisbane, Australia 2014. Image 2: Anna Carey in her home studio, Venice 2015. Image 3: Anna Carey outside her balcony, overlooking North Venice 2015. 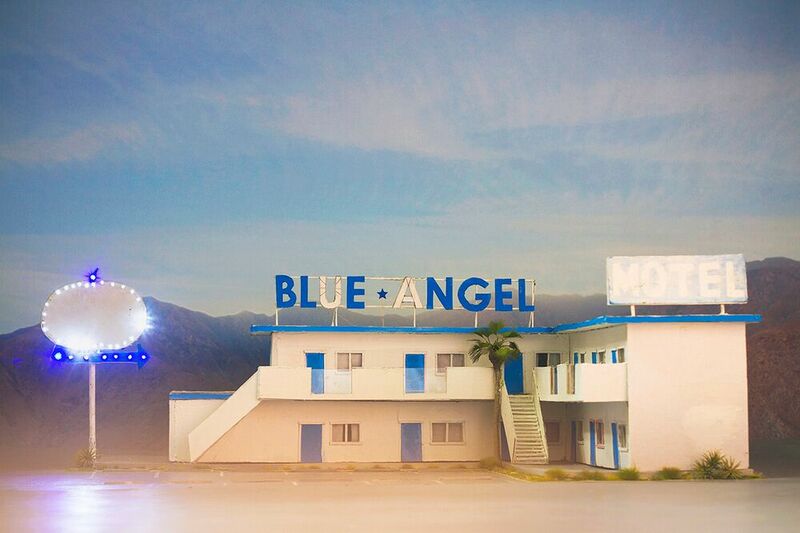 Image 4: ‘Blue Angel’, Anna Carey 2014_Exhibited at Photo LA, USA 2015. Image 5: Detail, Star Dust work in progress. 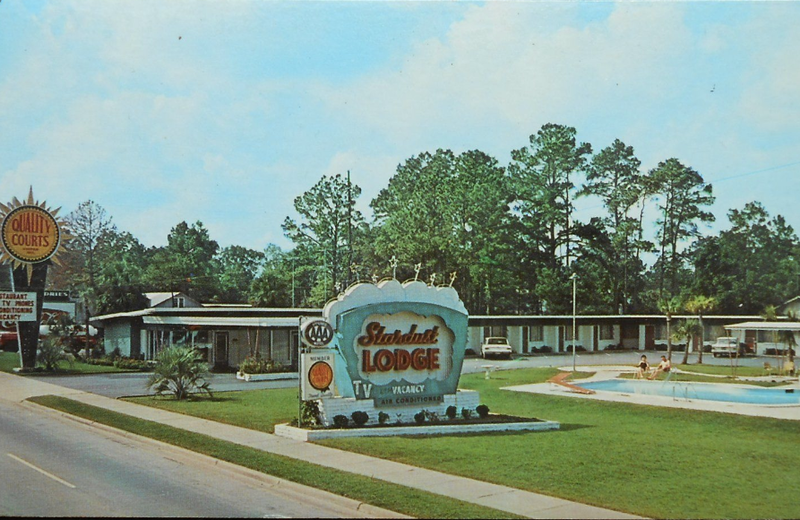 Image 6: Star Dust motel postcard. All images courtesy of Anna Carey.